For other people named David Patten, see David Patten (disambiguation). 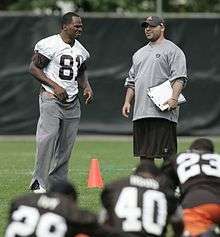 Patten (left), while playing for the Cleveland Browns, and coach Dan Shamash (right) during 2009 training camp in Berea, Ohio. David Patten (born August 19, 1974) is a former American football wide receiver. He was signed by the Albany Firebirds as a street free agent in 1996. He played college football at Western Carolina. Patten was also a member of the Washington Redskins, New Orleans Saints, Cleveland Browns and New England Patriots. He earned three Super Bowl rings with the Patriots. Patten played football at Lower Richland High School in Hopkins, South Carolina, where he caught passes from future Major League Baseball player Pokey Reese. After graduating from high school, Patten attended Western Carolina University. As a junior in 1994, he averaged 3.6 catches, good for sixth in the Southern Conference. In 1995, his senior season, Patten recorded 59 catches for 881 yards and was named to the All-Southern Conference team. Patten went undrafted in the 1996 NFL Draft but began his professional football career by playing for the Arena Football League's Albany Firebirds in the summer of 1996. He signed late in the AFL's season and played in their final regular season game on August 2, 1996 in a 54-49 win over the Milwaukee Mustangs. Patten caught two passes for 37 yards in the game. Patten saw action in both Firebirds' playoff contests the same season. In a first round 79-58 win over the Mustangs the following week in Albany, Patten caught four passes for 111 yards and one touchdown. He then played in the Firebirds' quarter-final loss at the Iowa Barnstormers. Patten caught three passes for 42 yards as his Firebirds were eliminated 62-55 by Iowa and their quarterback Kurt Warner. After spending the rest of the 1996 season out of football, Patten was signed by the New York Giants on March 24, 1997. He was waived by the Giants on August 24, 1997, and re-signed to their practice squad the next day. Two days later, the Giants signed Patten to their 53-man roster. He played in 16 games for the Giants in 1997, catching 13 passes for 226 yards and returning eight kickoffs for 123 yards. In 1998, Patten played in 12 games for the Giants, returning 43 kickoffs for 928 yards and one touchdown, while also catching 11 passes for 119 yards and a touchdown. In 1999, his final season with the Giants, Patten played in 16 games, leading the team with 33 kickoff returns for 673 yards as well as recording nine receptions for 115 yards. Following the 1999 season, Patten signed as an unrestricted free agent with the Cleveland Browns. He spent one season with the team, starting 10 of 14 games and recording 38 receptions for 546 yards. In 2001, Patten signed as a free agent with the New England Patriots. He started 14 games at wide receiver for the Patriots in 2001, setting a then-career-high with 51 catches for 749 yards. Against the Indianapolis Colts on October 21, 2001, Patten became the sixth player in NFL history to run, catch, and throw for a touchdown in a 38–17 win; he was named AFC Offensive Player of the Week for his performance. Patten caught a touchdown pass from Drew Bledsoe in the AFC Championship Game at Pittsburgh and then caught a score from Tom Brady in the Patriots' Super Bowl XXXVI win over the St. Louis Rams in February 2002, earning his first Super Bowl ring. In 2002, Patten again started 14 of 16 games, setting a career-high with 61 receptions, 824 yards, and five touchdowns while leading Patriots receivers with 13.5 yards per catch. Patten started five of the team's first six games in 2003 before being placed on injured reserve on November 7. Patten returned to start 11 of 16 games in 2004, recording 44 catches for 800 yards and seven touchdowns and earning his third Super Bowl ring in a win over the Philadelphia Eagles in Super Bowl XXXIX; however, he did not start a game in the playoffs, being surpassed by younger wide receivers Deion Branch and David Givens on the depth chart. Following the 2004 season, Patten signed a five-year, $13 million contract with the Washington Redskins. Patten started seven of the first nine games of the season with the Redskins before being placed on injured reserve on November 18. He finished the season with 22 receptions for 217 yards. In 2006, Patten played in the first four games of the season, recording one reception for 25 yards, his only catch of the season. He was inactive for the remainder of the season except Week 17. He was released by the Redskins on March 22, 2007. A few weeks after his release from Washington, Patten signed a one-year deal with the New Orleans Saints. He went on to have the second-best season of his career statistically, catching 54 passes for 792 yards and three touchdowns. Patten started three of the first four games for the Saints in 2008, but played in only one game after that due to injuries. He finished the season with 11 catches for 162 yards and one touchdown and was released by the Saints following the season. Patten signed with the Cleveland Browns for the second time on March 23, 2009. He was released on September 5, 2009. On February 24, 2010, Patten was signed by the Patriots. On July 31, 2010, Patten announced his retirement. David Patten has returned to Western Carolina University to complete his degree in social work and will be coaching the Western Carolina University Catamounts, under second-year head coach, Mark Speir. ↑ Solomon, Jerome (2005-03-04). "Patriots corner Starks; Redskins ink Patten". The Boston Globe. Retrieved 2010-02-24. ↑ "Former Catamount David Patten Joins WCU Football Coaching Staff Patten spent 12 seasons in NFL camps during his professional career". WCU Football News. 2013-02-11. Retrieved 2013-05-01.